After nearly four years of research, writing, proofing, adjusting, and proofing again, notification arrived yesterday, April Fool’s Day, that the book is published. But the message went on to say that it would not be posted at Amazon et al for seven to ten days. Alas and a lark, it appeared this morning! It can also be found at Amazon UK . Actually, the rush of seeing it available for purchase exceeded the moment I hugged and reveled in the delight of the first book proof. My perfectionist and fabulous designer, Sallie Kautz, was equally impressed and excited. I want to share that exhilaration with you. There will be a celebration at the colony’s only remaining building, Holy Trinity Episcopal Church, Fruitland Park, at 4 p.m., Sunday, April 21. Books will be available for purchase along with signing by the author, D. R. S. Bott. After then The Chetwynd Chronicles can be bought, not only at Amazon, but at Pepper’s Book Trunk—the trunk of my red Toyota. 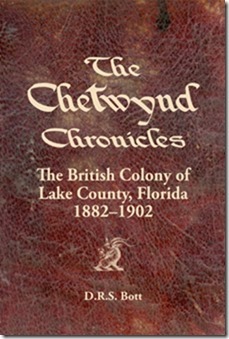 Needless to say, I am very proud, pleased and yes, honored, to have written the only history about the Colony of Chetwynd and about those who lived there. Enjoy! I loved the book and have recommended it to all the family. A wonderful bit of research,Donna.An interesting read. A glimpse of history saved in the nick of time. Thanks so much, Alan! I’ve been wondering about your thoughts as you read about Granville’s accomplishments. I’d love to know how others of the family react.